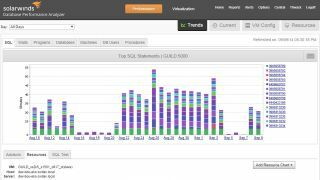 SolarWinds has launched an update to its Database Performance Analyzer (DPA), a measurement tool designed to predict, detect and resolve database issues. SolarWinds DPA 9.0 is capable of monitoring the following data platforms: SQL Server, Oracle, Sybase and DB2. The performance monitoring solution is available via physical, cloud-based and VMware for organizations looking to gain deeper visibility into poor database response times. With DPA, businesses can monitor historical performance trends to determine potential or ongoing problems. The updated version of DPA includes storage resource visibility and correlation. This enables database administrators to monitor how storage impacts database latency and disk performance to impact database response time. With DBA 9.0, Dada said SolarWinds can create up to five years worth of trend analysis so that administrators can see how the database performed during similar periods of workload strain. “You can create a baseline to use historical data to alert you to something you should be looking at before a problem starts,” he added. SolarWinds Database Performance Analyzer pricing starts at $1,995 for SQL Server and Oracle Standard Edition, and $3,495 for Oracle Enterprise Edition, DB2 and Sybase.